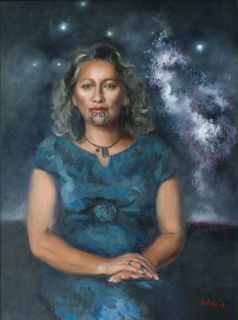 Most artists exhibiting with Kiwi Art House paint on commission. The advantages are you decide on the subject and what goes into the painting, while leaving composition to the artist. 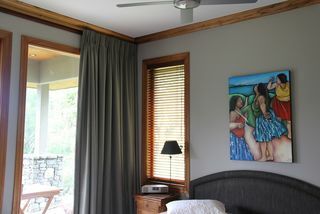 The painting is be made to the size you need and your budget. Examples from Gallery artists include, a family walking along Oriental Bay in Wellington by Zad Jabbour, a watercolour of husband and wife in Wellington's Cuba Mall by Dianne Taylor, a watercolour of a South Island sheep station where the clients' wedding was held, by George Thompson, a scene of the Marlborough sounds for a wedding gift, by Dianne Taylor, a Wellington villa and neighbouring houses for the home owner, by George Thompson. Prices and Payment. Prices are usually close to whatever the artist normally charges for similar sized work. Usually one thrid deposit is required before the artist begins with the balance paid when the painting is finished. Although there can be some variation depending on the artist. With a custom painting you select the style of art you prefer when picking the artist. The following artists are the most popular for general commissions, below are images from two recommended specialists for portrait paintings, and for Lauryrne Hart's larger size art deco style art. George Thompson - Representational loose style with strong use of colour, watercolour or acrylic. Specialises in commissions of urban scenes and houses. Dianne Taylor - Watercolour artist, all subjects. Alfred Memelink - Watercolour artist specialising in foreshore and Wellington scenes. Phil Dickson - oils and watercolours in a realism style, skilled in cityscapes and coastal scenes. 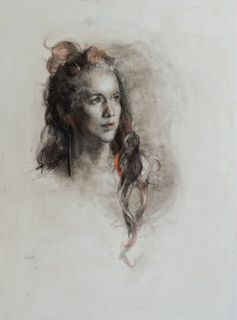 Escha van den Bogerd - Can do any subject and create new versions of her older paintings..
A beautiful portrait painting can capture the essence of a loved one far better than a photograph. Two talented artists offer their services as portrait painters. Both have high skill levels and years of experience. Joy de Geus will paint a watercolour portrait from photographs, for from $500 to $700, depending on size.Joy is a Wellington watercolour artist who studied art at graduate and post graduate level in France, Holland and Italy. 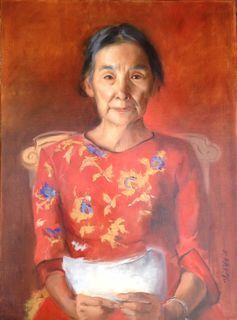 She has painted portraits for many years, including working as a street portrait artist in Paris. Tatyana Kulida will paint an oil portrait for $1900 (prices may vary depending on size and if there is more than one subject) Tatyana specialises in portraits from real life, but will also paint from photographs. She is originally from Russia, is now living in Wellington NZ. She studied art in he USA and trained in classical painting and sculpture for three years at the Florence Academy in Italy, where she also became a tutor. Tatyana can also creat a clay portrait bust. See the Sculpture page.